The European Research Council, ERC, has just published the results of the Advanced Grant 2013 call. Jean-Paul Laumond, senior researcher in the field of robotics at LAAS-CNRS, has been selected for his project Actanthrope : Computational Foundations of Anthropomorphic Action. This highly selective grant funds projects of Europe's best researchers in order to stimulate exploratory research and to enable them to pursue their most ground-braking ideas. Of the 2408 submissions, 284 were distinguished in 18 countries. France will host 35, 13 carried by CNRS researchers. Actanthrope intends to promote a neuro-robotics perspective to explore original models of anthropomorphic action. The project targets contributions to humanoid robot autonomy (for rescue and service robotics), to advanced human body simulation (for applications in ergonomics), and to a new theory of embodied intelligence (by promoting a motion-based semiotics of the human action). ERC Advanced Grant funding targets researchers have already established themselves as researchers leader in their own right. The attribution to Jean-Paul Laumond also highlights the entire humanoid robotics theme at LAAS. Indeed, under his leadership, research is devoted to, since 2004, the study of anthropomorphic movement in two main directions : humanoid robotics and modeling of human movement in conjunction with neuroscience. The Gepetto team, which he founded in 2006 in this spirit, carries out its work in a remarkable scientific cohésion. Gepetto is also involved into several other European projects. 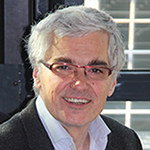 Jean-Paul Laumond, IEEE Fellow, is a roboticist. He is Directeur de Recherche at LAAS-CNRS (team Gepetto) in Toulouse, France. He received the M.S. degree in Mathematics, the Ph.D. in Robotics and the Habilitation from the University Paul Sabatier at Toulouse in 1976, 1984 and 1989 respectively. From 1976 to 1983 he was teacher in Mathematics. He joined CNRS in 1985. In Fall 1990 he has been invited senior scientist from Stanford University. He has been a member of the French Comité National de la Recherche Scientifique from 1991 to 1995. He has been a co-director of the French-Japanese lab JRL from 2005 to 2008. He has been coordinator of two the European Esprit projects PROMotion (Planning RObot Motion, 1992-1995) and MOLOG (Motion for Logistics, 1999 - 2002), both dedicated to robot motion planning and control. In 2001 and 2002 he created and managed Kineo CAM, a spin-off company from LAAS-CNRS devoted to develop and market motion planning technology. Kineo CAM was awarded the French Research Ministery prize for innovation and enterprise in 2000 and the third IEEE-IFR prize for Innovation and Entrepreneurship in Robotics and Automation in 2005. Siemens acquired Kineo CAM in 2012. In 2006, he launched the research team Gepetto dedicated to Anthropomorphic Motion studies along three perspectives: artificial motion for humanoid robots, virtual motion for digital actors and mannequins, and natural motions of human beings. He teaches Robotics at Ecole Normale Supérieure in Paris. He has edited three books. He has published more than 150 papers in international journals and conferences in Robotics, Computer Science, Automatic Control and recently in Neurosciences. He has been the 2011-2012 recipient of the Chaire Innovation technologique Liliane Bettencourt at Collège de France in Paris. - Motion segmentation: what are the sub-manifolds that define the structure of a given action? - Motion generation: among all the solution paths within a given sub-manifold, what is the underlying law that converges to the selection of a particular motion? In Robotics these questions are related to the stimulating competition between abstract symbol manipulation and physical signal processing. In Computational Neuroscience the questions refer to the quest of motion invariants. The ambition of the project is to promote a dual perspective: exploring the computational foundations of human action to make better robots, while simultaneously doing better robotics to better understand human action. A unique “Anthropomorphic Action Factory” grounds the methodology that promotes an engineering perspective to study the two main components of a physical action: locomotion and manipulation. The “Factory” aims at attracting to a single lab, researchers with complementary know-how and solid mathematical background. All of them will benefit from unique equipments, while being stimulated by two challenges on dynamic locomotion and by two challenges involving manipulation capabilities.